The Detroit Yacht Club is a different organization from the Detroit Boat Club, a group that also built an impressive clubhouse on Belle Isle for their boating activities. The Detroit Yacht Club (DYC) was founded in 1868 as prosperous Detroit residents sought to enjoy sailing on their river and in the two adjoining Great Lakes. The first clubhouse and boat facility was erected at the foot of McDougall Street in the 1870s. In the 1880s, the membership was riven, and one group decided to split and formed the Michigan Yacht Club. 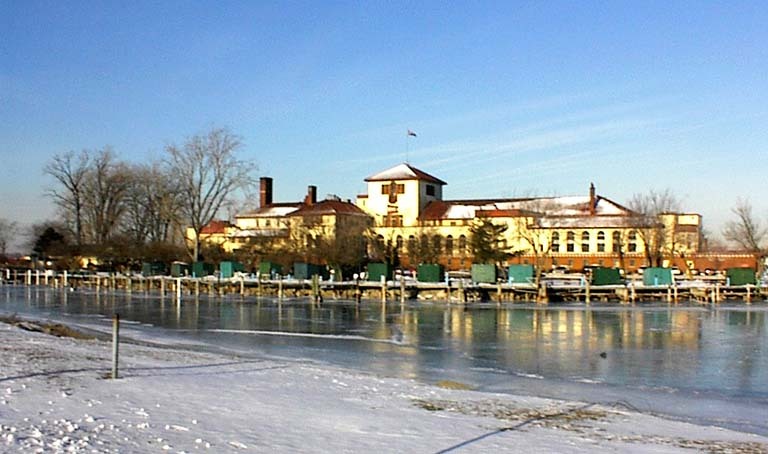 The DYC continued and, in 1891, built their first clubhouse on Belle Isle. Fires were very common in this era before the use of safer building materials and strong fire codes, so the DYC clubhouse on Belle Isle was destroyed by flames in 1904. They constructed a replacement. Shortly thereafter, the vehicle industry generated larger numbers of families who enjoyed sailing or using motorized boats and could afford the cost of club membership. In 1923, the new MacArthur bridge connecting the mainland to Belle Isle was completed as was the magnificent DYC building shown in the picture above. The club selected one of the city’s most productive and creative architects of that era—George Mason—who, in turn, selected a Mediterranean or Spanish-style for this very large building located at the northwest corner of Belle Isle. The DYC is linked to the accomplishments of the nation’s most famous and accomplished power boat racers. Effective gasoline powered engines were developed for boats and cars at about the same time. Many of the early designers of car engines had some or extensive experience building or designing engines for vessels. David Buick, for example, designed engines for boats before he developed the highly successful and powerful small engine that contributed to the great success of the make that bears his name. Garfield Wood was a self-taught engineer who became the nation’s leading boat racer. About 1920, he began devoting his efforts to designing high speed boats for racing. He used airplane engines to power some of his boats and designed innovative hulls. As early as 1921, the Detroit Yacht Club sponsored hydroplane races and, thereby, they became one of the nation’s leading organizations in boat racing. Gar Wood, in 1931, became the first man to attain a speed in excess of one hundred miles per hour in a boat. The prosperity of Detroit in the 1920s greatly benefited the DYC and their membership reached 3,000 in that decade. The Depression and demographic shifts after World War II had severe consequences for the DYC. However, the organization not only survived, but has retained its role as one of the nation’s leading boating clubs. Their ideal location—eleven acres on the Detroit River, but close to Lake St. Claire—helps a great deal. They also had the financial resources to expand, renovate and update their large clubhouse. The DYC very successfully promotes the use of their facility for weddings, meetings, parties and events.